The bottle jack is one of the most popular automotive jacks because of its compact design, ease of use, and high-efficiency. It can easily find storage space in most vehicles, it's easier to use than scissors jacks, comes in different sizes for different vehicles classes, and it's more portable than floor jacks. In this bottle jacks review, you'll get all the information that you need to understand bottle jacks so that you can make the right choice for your vehicle. The Pro-Lift B-012D is a nicely-sized but powerful bottle jack that can lift a range of vehicles from average sedans up to 24,000-lb trucks. In addition to its 12-ton/24,000-lb top weight capacity, it also offers a lift of 9.5 to 18.9 inches, which is a 9.4-inch difference. Its screw extension can also extend up to 7 inches, making it easier to adjust this jack to many vehicles or work heights. 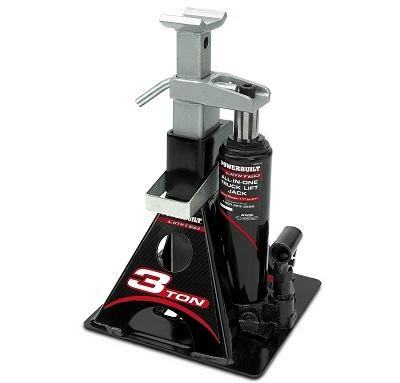 If your vehicle has a ground clearance above 9.5 inches, then this top-rated bottle jack will probably fit in perfectly. It comes with a carrying handle, weighs 17 pounds, features a solid steel saddle, and it's designed to meet ANSI/PALD standards. Pro-Lift backs this offer with a 90-day warranty. One major issue with bottle jacks is that they can fail, so it's not advised to creep under any vehicle that's resting on bottle jacks. On the other hand, bottle jacks are very convenient for raising vehicles. Powerbuilt solved this dilemma by integrating a jack stand into its 640912 bottle jack design, creating thereby a unique product that it has also gone ahead to patent. It can handle weights up to 3 tons and its lifting range is from 11 to 21 inches, which makes 10 inches. This jack itself weighs 22 pounds and combines with its wide base design to make it a rather bulky jack. You may also have to always make sure that the safety lock is in place, a rather scary thought, and process, but if you can handle all that, then Powerbuilt backs the package with a 1-year warranty. 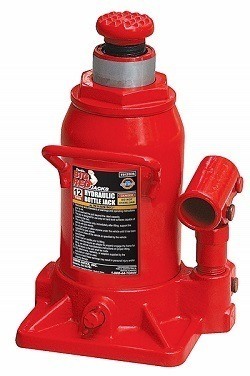 A jack's weight capacity is one thing, but how easy it is to use, how much it weighs, and the amount of force that you need to pump it are all important considerations in the search for the best quality bottle jack. 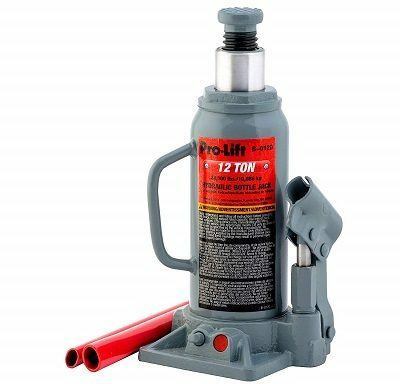 Pro-Lift offers a lightweight and easy to use bottle jack here with the B004D 4-ton jack. It's ideal for most sedans, vans, minibusses, and small SUVs. Weighing just under eight pounds, it's also easier for most persons to carry around, and it offers a lift range from 8 to 15.4 inches, which fits perfectly for most vehicles. 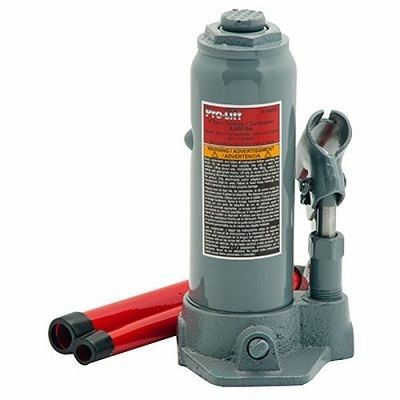 Pro-Lift additionally heat-treats critical stress areas on this jack to make it better performing, but it only offers a 90-day warranty on it, which is still not bad, compared to its price. The OTC 9320 Stinger Series jack is the kind of jack that you get when you want only the best. This offer is for the 20-ton version, but it's also available in 2-, 3-, 5-, 8-, 12-, and 50-ton versions. OTC chromes the piston pump and the ram to increase this jack's rust resistance and extend its durability. It also includes a free seal kit in the package to help extend the jack's life. What you may not find impressive is the 2.3-inch height of the screw extension, the 6.9-inch stroke, and the price of the jack, which is higher than that of most other offers. It comes with a 2-year warranty, however, and OTC forges the base and cylinder to guarantee a long-lasting and leak-proof bottle jack. Your vehicle could have really low ground clearance, especially if it's a sedan, and you want a bottle jack for it that fits. That's when this Shorty jack from ATD Tools come in. It's only six inches high when completely depressed and comes with a 1.6-inch extension screw, which is somewhat little, but when you consider that this jack is primarily designed for shortness, then it doesn't matter much. Another unimpressive fact is the lift range, which is a mere 3 inches, but that's the trade-off for having a short bottle jack. 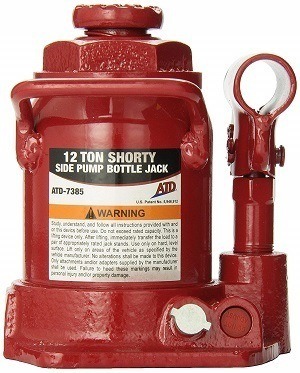 The taller 12-ton version from ATD Tools moves a full 6 inches and has a 3.1-inch high extension screw. 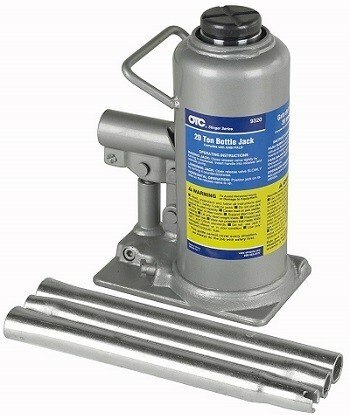 ATD Tools rates this jack for only vertical use and backs it up with a 1-year warranty. 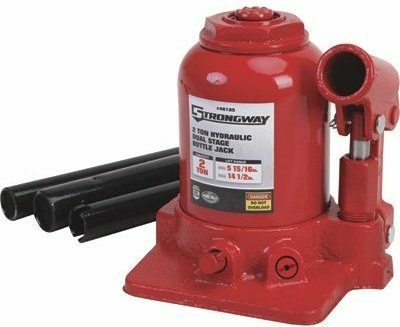 For those who got disappointed from the previous bottle jack's low lift, Strongway offers you the solution to get a low profile bottle jack that has a nice 6.3 inches of ram-travel. It also comes with a longer extension screw which measures 2.3 inches, giving it a top lift of 14.5 inches. This dual-stage jack has just a 2-ton rating and this can mean different things for different people. For a sedan, mini-bus, and small SUV owners, the 2-ton rating is definitely enough and so, this will make a great jack. Owners of larger trucks and RVs, however, will need to find something else. 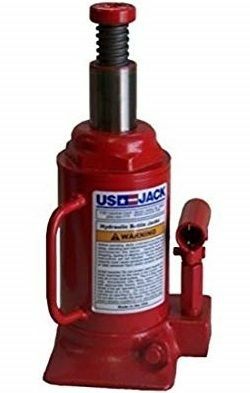 This jack meets ASME PALD standards, can get used in a horizontal position, includes overload and bypass valves, and comes backed by a 1-year manufacturer warranty, to make one of the best hydraulic bottle jacks in the market. Some people dislike Made-In-China products. So if you are one of those that prefer a Made-In-America bottle jack and you've got the money to pay for it, then here's your deal. This is one of the best car bottle jacks that you'll find for large trucks and machinery. It's rated 12 tons and weighs 21 pounds on its own. The cam travel is 6.3 inches from 9 to 15.3 inches and if you add the 4.3 inches of the extension screw, you'll get a total height of 19.5 inches, when extended. Further features include a wide base made from ductile iron, a fluid bypass, and a stop ring to prevent over travel and its related damages. If you need a heavy-duty bottle jack that's dependable but comes at a low and affordable price, then this offer might be for you. It offers a 12-ton weight capacity and it comes at a very attractive price. The lift range starts from 7.5 inches to 11 inches, which is just a 3.5-inch difference and less than what most other jacks offer. On the other hand, it's made from lightweight forged steel construction, which keeps its weight at just 16 pounds, with its critical stress points reinforced for improved strength and durability. Another issue is that Torin recommends this jack for only vertical use and not for downward or horizontal use. It's however, backed by a 1-year warranty. Powerbuilt offers you this heavy-duty 12-ton jack with its forged steel saddle and oversize cast iron base at a good price. The lift range is 8.6 to 16.3 inches and it comes with a pin-style release valve for easier operation. It's also relatively lightweight for a 12-ton jack, with its 13.9-pound weight. This jack also comes in different sizes ranging from 2 tons to 30-ton weight capacities, allowing you thereby to choose the best bottle jack for your needs. Although Powerbuilt provides no specific information about its warranty, it probably falls into the company's standard 1-year warranty coverage, and it's guaranteed to meet or exceed all ANSI standards. It's not everyone that wants to lift a monster truck. Some people just want to lift a smaller vehicle, such as a sedan or a hatchback, and that's what this jack is for. Watch out for your vehicle's ground clearance though because this isn't a low-profile jack. Its lift range starts at 7.5 inches and it can lift the vehicle up to 14.3 inches. 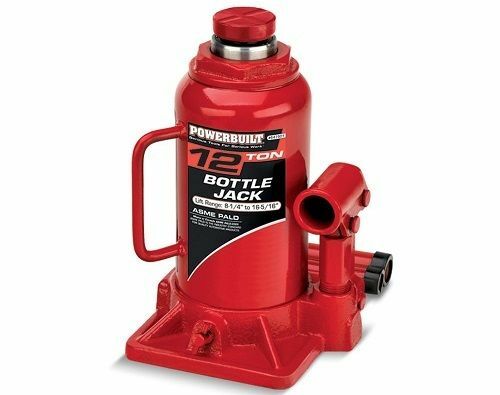 In case 4 tons isn't exactly what you need, Torin also offers a 2-ton version of this car bottle jack, plus a 6-ton, 8-ton, and higher, up to 50 tons. Each unit is factory tested and guaranteed to meet ASME safety standards, plus Torin covers it with a 1-year warranty. These two jacks often confuse first-time buyers because they are both automotive jacks, but look completely different from each other. Following is a closer look at these two jacks, with a focus on their differences, advantages, and disadvantages. This should give you enough information to clear all doubts in your mind and enable you to make an informed choice between the two. As their name suggests, bottle jacks have the shape of a bottle. They are round and narrow lifting devices that are portable and easy to use. Because of their bottle design, they are high-clearance jacks, meaning that you can only use them on trucks and other vehicles with similar high clearance. Bottle jacks are not ideal or good for low-profile vehicles like racing cars. On the plus side, bottle jacks have a high lifting capacity and they additionally include extension screws that make it easy to adjust the jack to the vehicle's height. The bottle design also makes these jacks easy to store. They occupy less space and so, can easily fit into one truck's compartment or the other. Bottle jacks are also cheaper than floor jacks. With floor jacks, the design is completely different from bottle jacks. Here, the jack is as flat and close to the ground as possible, making it able to reach under very low-profile vehicles. Floor jacks are also wide and bulky, but they come with wheels to make them easier to push around. Their long pumping handles make them ideal for quickly raising and lowering vehicles. One nice thing about floor jacks is their safety, which is better than that of bottle jacks. You can get under a vehicle suspended by a floor jack but you shouldn't do that with a bottle jack. That's why floor jacks are the preferred choice for garage work, although they cost more than bottle jacks. They are also more stable because of their wider bases. Once you've decided that it's a bottle jack that you want, the next step is to figure out which bottle jack exactly will do the job. So, you'll be making your choice based on their features and specifications. Bottle jacks use hydraulic technologies to work, but different manufacturers come up with slightly different methods to implement these technologies, leading to a range of bottle jack sizes, capacities, and capabilities. Following is a listing of the important aspects of a bottle jack that you need to look out for when making your choice because understanding them will help you to make the right choice. 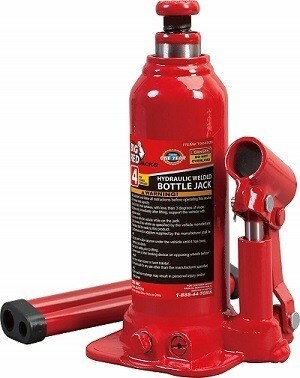 A bottle jack's weight capacity is the amount of weight that it can comfortably handle without any issues. It's usually given in tons and can range from two tons up to 20 tons and higher. The jack you should choose, therefore, needs to correspond to your vehicle's weight. Most sedans weigh around two tons, while SUVs weigh about three and more tons. Keep in mind, however, that a jack supports only about 60% of a vehicle's weight, so a 2-ton jack can actually handle a 3-ton car. Don't push your luck though, just get a jack with the general or even higher weight capacity for your vehicle. A 2-ton jack for sedans and a 3- to 5-ton jack for most SUVs is a good recommendation. Asides from how much weight a bottle jack can handle, the next major point in making your choice is the lift range. A jack's lift range is simply the top height that it can travel to lift an object. Most bottle jacks that you'll find offer a lift range from 9-18 inches, so it's left for you to figure out if that will be enough or if you are going to need more. 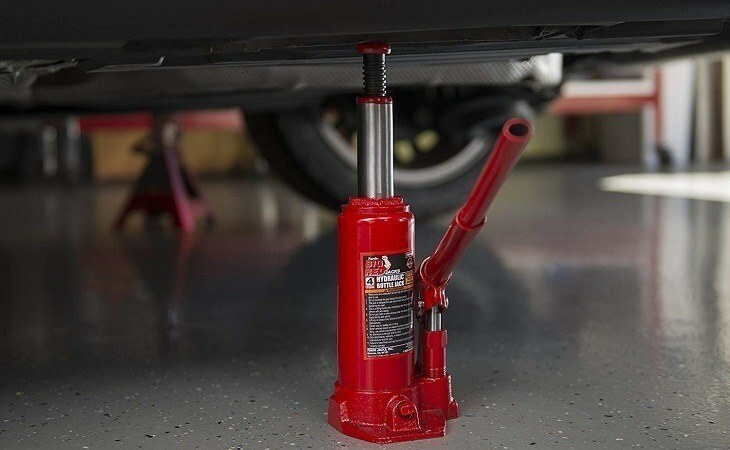 Keep in mind that nearly all bottle jacks come with an extension screw, which allows you to adjust the jack's height to the vehicle's exact height so that you can start lifting the car with each pump of the jack. Also remember to check your vehicle's ground clearance to make sure that it's higher than the jack's minimum height, which for instance, is nine inches for most bottle jacks. The materials used in the manufacture of a bottle jack and the workmanship quality level combine to determine how durable and efficient the jack is, as well as its lift range and how much weight it can carry. You'll find bottle jacks made from combining materials like iron and alloy steel in different grades and qualities. The welds' quality between the different parts is also important. If you've got an eye for such things, then a visual inspection will tell you just how good or bad a bottle jack potentially is, else, you may need to depend on the brand, warranty, and price combination. This is another method to estimate a product's quality. A good brand will always offer a good product and stick to it with a good warranty. The downside is that it often costs a little more. It's this balance between quality and price that you'll have to strike by yourself, depending on how much you are willing to spend, the overall brand quality and warranty length. Most bottle jacks work in nearly the same way, so once you can use one, then you can use them all. Just make sure that it comes with a long pumping handle to make the pumping easier. We've come to the end of this bottle jacks review and you have seen the top offers out there. You should also know how to make the right choice now. Whether you need to lift a heavy truck, a trailer, or a small vehicle, you have seen that there's a jack for it. And since our needs are different, this last choice is yours alone to make, because you're the only one that knows exactly what you need.